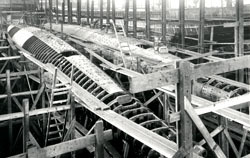 H-class subs under construction at the Canadian Vickers Ltd. shipyard, Montreal, in 1916. In 1914, the modern submarine was completely untried in war, but its potential as a deadly weapon of stealth was widely understood. Indeed, near panic ensued off Canada’s west coast when the first Canadian submarines were spotted near Esquimalt harbour on the morning of Aug. 5, 1914. While an examination steamer raced toward the harbour, gunners manned nearby coastal batteries. Only the sight of a tablecloth—waving from the conning tower of one of the subs—gave the gunners pause. This bought enough time for word to filter down that the subs were friendly. The incident conveys the enormous accretion of strength two small submarines added to the defence of Canada’s west coast in the summer of 1914. With the mere threat of submarines—silent, unseen, undetectable and lethal—the German navy would be foolhardy to attack. But, it was an astonishing accident of history (not an act of policy) that the fledgling Canadian navy—a navy virtually without a fleet—should acquire such radically new weapons at the outset of war. But it happened, and the arrival of the submarines marked the beginning of Canada’s first submarine service: for the next decade, it constituted the most powerful component of the fleet. Submarines were a recent development, and so they were not part of any Canadian fleet plan prior to 1914. The first submarine to enter British service, named Holland 1 after her American designer, was launched in 1901. A small vessel propelled by a combination of gasoline engines on the surface and batteries while submerged, she had a range of 235 nautical miles on the surface, 20 miles submerged and was armed with a single 18-inch torpedo. By 1902, a further 10 British redesigned Hollands were on order. These were larger boats with a new innovation, the periscope. Shortly after that, the French put the first diesel engine into a submarine. The first Canadian submarines were purchased in haste, on the morning of Aug. 5, 1914, in the middle of the Strait of Juan de Fuca. They were bought from a private American firm using money advanced by the British Columbia government. Although the whole affair had the air of a charade, the naval establishment at Esquimalt knew what it was doing. Against the threat of large German cruisers, submarines were more of a deterrent than the tiny cruiser HMCS Rainbow (The Original Rainbow Warrior, May/June 2004). And so the navy moved fast when news arrived that two small Chilean submarines, being completed in Seattle, could be had for a price. The acting senior naval officer at Esquimalt, Royal Navy Lieutenant Henry Byng Pilcher, was quick to track down Lieut. Bertram E. Jones, also of the RN, who had recently retired from the submarine service. Jones was the former captain of the British sub C28, and it was he who carried the cheque in his pocket when the delegation from Canada met the American-built subs off Trial Island. And it was Jones, ably assisted by Chief Engine Room Artificer Reginald Wood—the chief engineer at Esquimalt—who gave the submarines a thorough inspection before the money and subs changed hands. Two days after their arrival, the submarines were purchased from the B.C. government by Ottawa and duly commissioned HMCS CC.1 and CC.2. That transaction marked the birth of the Canadian submarine service. Getting the subs away from under the nose of the American navy was only part of the problem. The subs also needed torpedoes. There were no British 18-inch torpedoes on the west coast, but it was soon discovered that two Chilean practice torpedoes—both of the right size—were being stored in a Seattle dockyard. These were acquired in a clandestine operation using a high-speed motor launch at night, running the gauntlet of the U.S. coastal forts and patrols. Unfortunately, the torpedoes lacked the gyroscopes, primers and detonators needed to turn them into weapons. These devices were locked away in the shipyard office and were closely watched by U.S. authorities after the torpedoes had disappeared. Nonetheless, there were men who were prepared to do what was necessary to get the equipment. However, faced with the prospect of a direct and possibly deadly confrontation with American security, the navy demurred: torpedoes were now on their way from Halifax. In any event, the Germans could not know the subs were unarmed. Crews for the new submarines were picked from local personnel, including volunteers from Rainbow and the British sloop Shearwater. Three officers and 16 ratings were needed for each boat. Jones took command of CC.2, and was joined by Lieut. Bernard Leitch Johnson of the Royal Naval Canadian Volunteer Reserve, (RNCVR). Like so many others, Johnson qualified as a submariner by doing it. He had excellent supervision in Jones and in the new officer in command of submarines and the captain of CC.1, Lieutenant-Commander Adrian St. Vincent Keyes. Keyes was a pioneer submariner, having served in one of the original RN Holland boats in 1903, eventually commanding two submarines himself and the submarine tender HMS Onyx before retiring in 1909. As it turns out, Jones had qualified as a submariner while Keyes commanded the tender. By 1914, Keyes was in Toronto working for a railway company, and his name was on the emergency list of retired officers. His brother, Captain Roger Keyes, RN, was by then commodore of submarines in the United Kingdom. By the time the Canadian navy tracked him down, Keyes had already enlisted in the Queen’s Own Rifles of Canada, but was told to go west and take command of CC.1 and the submarine “flotilla.” Keyes thus became the first commanding officer of the Canadian submarine service. However, Keyes needed some officers for his boat. He took retired Lieut. Wilfrid T. Walker, RN, from Rainbow and Midshipman William McKinstrey Maitland-Dougall of the Royal Canadian Navy to complete the wardroom. Eighteen-year-old Maitland-Dougall was a graduate of the Royal Naval College of Canada class of 1912—the same class as Murray and Jones, who dominated the navy’s later history—and the scion of an old imperial naval family. Despite his youth, Maitland-Dougall commanded his own submarine before the war ended and died aboard her when she was sunk. If it was a simple accident of fate that presented the RCN with submarines in 1914, it was nothing short of divine intervention that placed the fledgling submarine service in the hands of fully qualified—indeed accomplished—submariners. And they would need all their skill and patience to make the formerly Chilean submarines work. Throughout their service, which lasted until the end of World War I, CC.1 and CC.2 were plagued by maintenance, trim and other problems. Submarines were, and remain, highly complex pieces of machinery: quite different from any other kind of naval vessel. Surface vessels can and do go to sea with only a portion of their machinery and weapons functional. The margin for a submarine, as the recent fire aboard HMCS Chicoutimi revealed, is much narrower. Submarines must not only be able to submerge, they must be able to manoeuvre at depth, track targets, release torpedoes and handle all the trim problems that arise from that. And, they must be able to surface again. Canada’s submarine service pioneers handled these things very well and that says a great deal about their high levels of skill and dedication. While the new RCN submarine service started operations on the west coast, the British Admiralty made clandestine arrangements to build submarines at the Canadian Vickers Ltd. yard in Montreal. The submarines, 335-ton H-class, were basically American and shipped in pieces from the U.S. and assembled—with some local fabrication of plates and frames—in Canada. Construction began in January and by the first week of February 1915, all 10 of the first contract were laid down. Progress was swift with 2,000 men working rotating, 12-hour shifts inside a compound guarded by the Canadian Army. H-1 was launched April 18, 1915, about the time the first RN crews arrived in Halifax. By May, the first batch of four subs was in commission and six more were nearing completion. It seemed Canada could build quite sophisticated warships if the conditions were right. Prime Minister Sir Robert Borden watched the secret submarine construction with growing interest in early 1915, not least because he wanted to secure British orders for warship building in Canada, including perhaps more submarines. The British responded by saying they already had as many subs as they needed, and planned to build no more in Canada once the 10 assembling at Canadian Vickers were complete. This news encouraged Borden and Admiral Sir Charles E. Kingsmill to petition the Admiralty to turn over two of the Montreal H-boats to the RCN. These boats would be based in Halifax and crewed by personnel trained on CC.1 and CC.2. When the Admiralty said it could not spare the boats, Borden suggested Canadian Vickers build two more for Canada. The British dithered and although senior British naval officers in Halifax opined that such weapons were needed on Canada’s east coast, the Admiralty insisted it could spare none and that Halifax was fine without subs. Even the Canadian naval staff had its doubts. Acquiring a submarine force by accident on the west coast was one thing, but it would be quite another to make a policy commitment to the formal establishment of a submarine service. The whole issue was settled—at least temporarily—when Borden recoiled in horror at the $600,000 price tag for an H-boat, although this is roughly what had been paid for each of the west coast subs. In the meantime, the Canadian-built H-boats went off to war in Europe, eventually taking two pioneer Canadian submariners with them. H-1 to H-4 departed for the Mediterranean in early June 1915. After a harrowing dispersal in a storm in the Cabot Strait and a reassembly in St. John’s, Nfld., they arrived in Gibraltar in early July. By then the second batch were ready to go, but there had been problems finding enough British officers and ratings to man them. 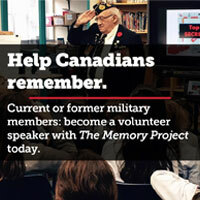 The Canadian submarine service offered 18 volunteer officers and men to man one sub for the crossing. When Admiralty proposed to simply keep the crew in the sub and send it on operations, the Canadian government withdrew the offer, but several key personnel nonetheless transferred from the Canadian boats. Among them were Johnson and Maitland-Dougall. The former had taken over command of CC.2 when Jones replaced Keyes in January as commanding officer of the flotilla. Johnson was appointed to command H-8, but not without some controversy. He was, after all, a “colonial civilian officer”—a volunteer reservist. Only fully qualified RN officers had ever commanded one the U.K.’s subs. But quite apart from his excellent qualifications as a navigator, Johnson had nearly a year’s experience in operating American designed submarines: more than any other available officer. This was—as things turned out—a mixed blessing, for he was soon seen as a vocal supporter of American design and technology, much to the disapproval of his British counterparts. However, the subs needed to be delivered and Johnson was ideally qualified. He was given command of H-8, and so a Canadian, who less than a year before was in the B.C. Pilotage Service, became the first colonial and the first reservist to command a British submarine. There was much hand-wringing over Maitland-Dougall’s qualifications as well. It helped that he was a regular force officer from a well connected naval family, had six months service in submarines and by early 1915 was aboard HMCS Niobe qualifying for his lieutenant’s exams. Maitland-Dougall was appointed to H-10 as third officer. Thus, while the west coast submarine flotilla went back into service in the spring of 1915 after its winter lay up, the second batch of H-boats left Montreal for Britain on July 3. They arrived in the U.K., via Halifax, without incident in early August. With them came two alumni of the Canadian submarine service, both of whom would command submarines on active operations and both of whom would achieve notoriety in the British submarine service.